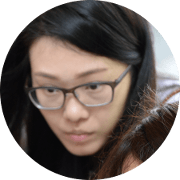 Ms Ong Wee Sing works as a Consumer Research Analyst at the Essilor Centre for Innovation & Technologies AMERA​. Despite her busy schedule, she always makes time to put her optometry skills to good use by volunteering with EVF or with other non-profit organisations. 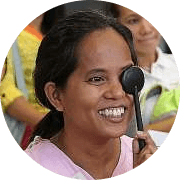 She has participated in several overseas and local missions, with the recent mission benefiting more than 1000 villagers in Bago, Myanmar where she played the role of volunteer optometrist. Wee Sing strongly believes in using her expertise for the benefit of others. As an optometrist, If I could use my expertise for the betterment of eye care wherever, why not? What are three key learnings you have gained from the volunteering activities? Deteriorating vision is not life threatening, but necessary in improving lives especially when one’s livelihood is concerned. 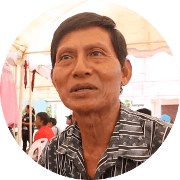 For instance, a man came in to the screening site at one of the volunteering missions, accompanied by someone else, but could eventually walk out on his own because he could finally see with the glasses we provided him. 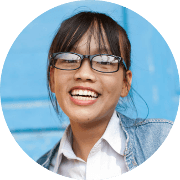 Poor vision is widely accepted as “no cure” in these developing countries; that they should accept it as part of their lives when many a times a pair of prescription glasses can make a huge difference. Sustainability of such activities is important – we can’t always be there to help, however we could train local volunteers in reaching out to more people in need. What is one thing you would like to say to others who are considering volunteering?